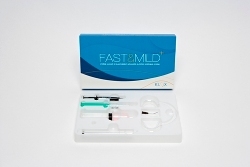 FAST&MILD is a patented in-office whitening system using the unique science of Biophotonics. The system is designed to be used with any visible light spectrum device (i.e. dental curing light). The whitening gel is prepared by combining the FAST&MILD orange-pigmented photoactive booster powder with the FAST&MILD 39% hydrogen peroxide. Once mixed, the peroxide concentration is reduced to 29%. When the gel is activated by the light source, the mixture to changes from bright orange to bubbly white in color. The color change indicates that the whitening gel has achieved full activation and the cycle is complete. Activation time ranges from 5 to 10 seconds per tooth, depending on the light intensity used. Minimally, an LED light with an intensity of 800 mW/cm² is recommended. Lights with 1400-1500 mW/cm² will produce optimal results. Each FAST&MILD kit contains materials to treat one patient. Kit contents include powder and peroxide components, application syringe, gingival barrier, cheek retractor, and a LifeSmile Teeth Whitening pen (15% carbamide peroxide gel) for maintenance. FAST&MILD In-Office Whitening System was used by 10 consultants to treat 44 patients. This in-office whitening system received an 86% clinical rating. The ability to perform in-office whitening using the FAST&MILD whitening system with just a standard curing light is a great advantage for dental practices that do not have a specialized bleaching light. Mixing the powder and liquid produces a gel that is fairly viscous and grainy. Consultants experienced better results spreading the gel evenly on the teeth with a brush than with the syringe provided. The color changing gel is a good visual indicator of complete activation of the peroxide. After activation is complete, the gel is suctioned off of the teeth and the application can be repeated. The kit contains enough gel for six applications; 4-6 applications are recommended. Sixty percent of patients experienced no discomfort during their whitening procedures, while 22% reported mild tooth sensitivity and gingival irritation. 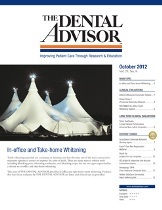 Of patients who had previously undergone whitening procedures, 48% rated FAST&MILD better and 19% rated it equivalent. Fifty percent of consultants would switch to FAST&MILD and 60% would recommend it to a colleague. Use a brush to spread the whitening gel on the teeth. Editor’s Note: This product is also known as Avalanche by Diversident in the U.S. and BlancOne by International Dental Supply in Italy.